As residents and visitors drive to and from Whittier through the Anton Anderson Memorial Tunnel for the first time this summer, they mark the beginning of another phase in the life of a unique transportation corridor. This route, however, was both difficult and dangerous. 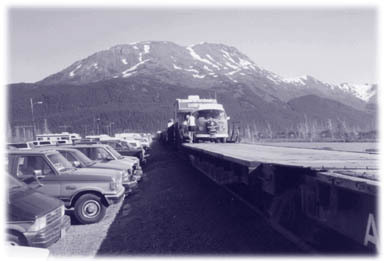 In 1914 the Alaska Railroad Corporation began to consider ways to construct a railroad spur to what is now the town of Whittier. While railroad manager Otto Ohlson championed this route because of its ability to provide a shortcut to a deep-water port (a trip to Seward added 52 more miles), this route didn't become a reality until World War II. The main advantages of using Whittier as a rail port was that it was a shorter voyage, reduced exposure of ships to Japanese submarines, reduced the risk of Japanese bombing the port facilities because of the bad weather, and avoided the steep railroad grades required to traverse the Kenai Mountains. In 1941, the U.S. Army began construction of the railroad spur from Whittier to Portage. This line became Alaska's main supply link for the war effort. Anton Anderson, an Army engineer, headed up the construction. The tunnel currently bears his name. Left: Steam locomotive traverses Bear Valley shortly after the tunnel opens. Right: Alaska Railroad Whittier shuttle passes stockpiles of stone needed for new track and road. 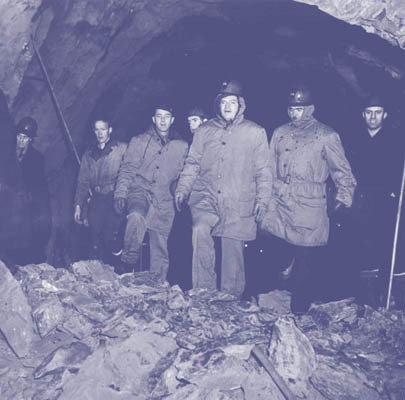 On April 23, 1943 workers completed the spur, which consisted of a 1-mile tunnel through Begich Peak and a 2.5-mile tunnel through Maynard Mountain, thus linking Whittier to the Alaska Railroad's main line at Portage. Growing demand for access to Whittier spurred the DOT&PF to link the community to the highway system. Constructing a highway to Maynard Mountain and engineering the 2.5 mile long tunnel to accommodate both a roadway and a railway. 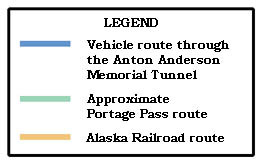 After studying all the options, DOT&PF, in consultation with the Alaska Railroad, the public, and tunnel, railroad, and highway experts, determined that the best solution was to construct a highway to Maynard Mountain and transform the existing railroad tunnel into a one-lane, combination highway and railway tunnel that allows cars and trains to take turns traveling through the tunnel. 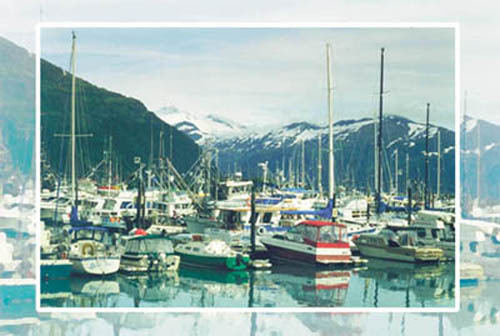 HDR Alaska, on behalf of the DOT&PF, prepared the "Whittier Access Project Environmental Impact Statement," an environmental analysis required by the National Environmental Policy Act (NEPA). The Federal Highway Administration (FHWA) approved the environmental impact statement (EIS) in November 1995. DOT&PF contracted with CH2M Hill to design the approaches and the bridges to the tunnel facility. 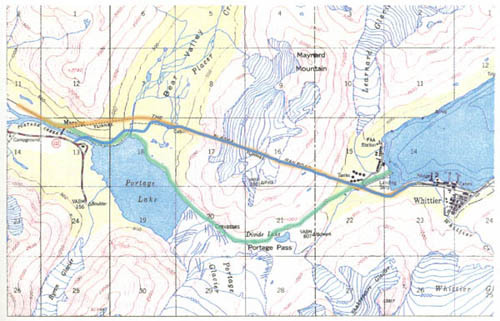 This project consisted of 1.5 miles of road, one 500 foot long tunnel and two bridges from the Portage Glacier Highway near the Begich-Boggs Visitor Center to the Bear Valley staging area. Herndon and Thompson, Inc. constructed this project. DOT&PF chose the project as its first design/build project. HDR Alaska was contracted to produce a conceptual design, write the performance specifications on which the final tunnel design was based and assist DOT&PF manage the construction contract. HDR brought together nationally recognized experts in design/build law, tunnel engineering, ventilation, tunnel control systems and railroad and railroad signal systems. In June 1998, DOT&PF awarded the tunnel contract to Kiewit Construction Company, who then selected the firm Hatch Mott MacDonald to design the project. As part of this design-build contract, the Kiewit team worked out a preliminary design for each component of the project with "over the shoulder review" from DOT&PF and HDR Alaska. The project consisted of more than 50 separate design and construction tasks, and construction began in September 1998. This unique facility meets all requirements for safety. Its design and construction will benefit all State of Alaska constituents and will provide the efficient and affordable access to Whittier and Prince William Sound that people have long sought. For details on design and construction, see the Tunnel Design page in this website.